A pasture-raised turkey gobbles at Two Coves Farm in Harpswell. Most people do not think of turkeys as backyard fowl, but they can be. Here are a few things to consider before adding these gobbling birds to your homestead. “A lot of people who choose to raise them because they’re going to eat them at Thanksgiving,” R. Scott Beyer, extension poultry specialist at Kansas State University, said. Beyer said turkeys are also raised to show at country fairs and to be kept as pets. Ann Accetta-Scott, blogger at Farm Girl in the Making, has been raising turkeys for three years on her 2-acre homestead in Preston, Washington. She said that while turkeys are great for meat, they can be more challenging than other birds. Don’t assume you know the law for owning turkeys just because you know the laws for chickens. The regulations for raising turkeys might be different than the other ordinances for backyard animals, so be sure to contact your local government and check your zoning codes before you decide to get your birds. Once you have determined whether you can legally have turkeys on your property, the next step is to make sure you have the right resources around — namely, feed. If you plan on eating your turkey, you also should know in advance where you will process the bird if you do not plan on butchering it yourself. The National Center for Appropriate Technology maintains a searchable database of small poultry processing plants that specifies whether the plant handles turkeys and whether they have been inspected by the U.S. Department of Agriculture and licensed by state agencies. How do turkeys compare to other backyard poultry? Because they are galliformes, the order that classifies heavy-bodied ground-feeding birds, turkeys can most closely be compared to chickens. Beyer said even their eggs have comparable flavors, though turkey eggs are slightly larger and often speckled. “Turkey eggs are actually really amazing for consumption as well,” Accetta-Scott said. Turkeys will lay fewer eggs than chickens, though. While chickens will lay eggs almost every day, turkeys will only lay about two eggs per week. Turkeys are much larger and stronger than chickens and they cost more money to raise. They generally require more pounds of feed per pound of weight gain than chickens, and turkeys usually grow to be at least four times as large. Baby turkeys, or “poults,” are a little less hardy and more sensitive to their environment than other kinds of backyard poultry. Poults will also need a good heating system. “Once poults arrive, they need to be in [a] brooder for the first month while feathers are growing and birds can regulate their own body temperature,” Anderson said. Brooders should start at a temperature of about 95 degrees Fahrenheit, and the temperature should be reduced about 5 degrees every week. Even once they are grown, turkeys tend to be more susceptible to disease than other backyard fowl. Beyer said to be extra cautious about keeping rodents out of turkey feeders, as they can carry diseases like coccidia, an intestinal infection that is common in turkeys, that can pass through the feces rats leave behind in feed. He recommended hanging feeders as an extra preventative measure. 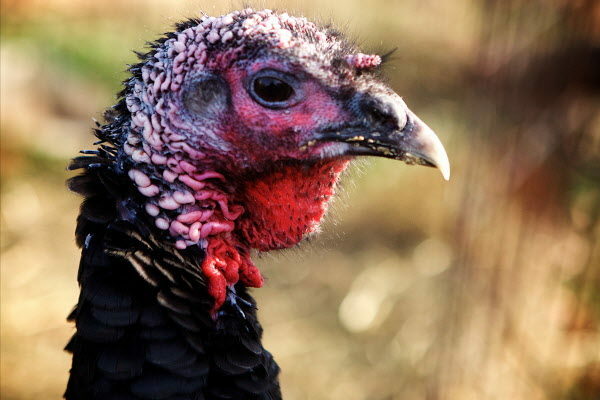 Turkeys are especially susceptible to Blackhead disease, a poultry disease that impacts the intestines and liver of affected birds, and thus should not be raised in the same enclosure as chickens. Farmers that grow their own turkeys tend to be more satisfied with the taste of the end product than those who opt for store-bought turkeys. What kind of turkey should I get on my homestead? The most common turkey is the Broad Breasted White, which is the kind that you most likely see in grocery stores during Thanksgiving. The advantage to the Broad Breasted White turkeys is that they do not fly and are less likely to roost in difficult-to-reach places, but small homesteaders may still prefer heritage breeds. “I like using heritage breeds with people who are doing just turkeys in their backyard because they grow slower and they are more structurally sound,” Beyer said. “They can have a lot of screw ups and they can still be healthy.” According to Anderson, standard turkey breeds are usually processed at 28 weeks of age. Meat chickens are generally processed after 6 to 12 weeks. Beyer said the Bronze turkey is “probably the most improved home turkey.” He also said Black Spanish and Bourbon Red are popular, perhaps in part due to their beautiful coloring, though they have not been improved much. No matter what kind of turkey you get, Anderson said to purchase poults from a National Poultry Improvement Program hatchery, which have that has closed flocks and do testing for diseases like pullorum and avian influenza. What kind of enclosure is best for turkeys? Make sure the pens offer protection from predators, access for turkeys to range, roosts for them to fly up into at night and a place to dust bathe. Beyer recommended at least 4 square feet per bird indoors and between 10 and 15 square feet outdoors. “What surprises people is really how little they range,” Beyer said. Be careful with free ranging heritage turkeys, though; they will fly up into trees and can be difficult to get down. Use wood shavings for turkey litter. Do not use sawdust or recycled newspaper. Turkeys will eat the former and starve to death, and splay their legs on the latter as poults. Turkeys may require a bit more maintenance than your standard backyard bird, but the effort may be worth it for a spectacular Thanksgiving feast.